Over the past decade or so, society has become drastically more accepting. Our community has taken huge strides towards eliminating the stigmas associated with being game. In the Dark Ages, so to speak, it was not uncommon, and perhaps even expected, for openly game people to be beaten up and mercilessly teased just for their life style choices. Now, however, there are gamers almost everywhere you look. We are no longer afraid to wear clothing displaying our game pride or to discuss our culture in public. Even the government is beginning to support us. Long gone are the days where we gamers were forced to hide in our basements, to lie about our nature. 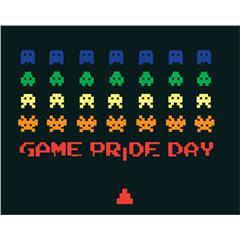 We have Game Pride now. I myself am openly game. I am or have been a member of many gamer community groups, such as LOTRO, WoW, COD, FIFA, etc. I have gone to various gamer events. I’m not hiding from myself, nor am I hiding from my peers. Some people are GAME. Get over it. However, there is one threshold I have yet to cross on my path to being completely out as a gamer. I have yet to come fully out to my parents. They have their suspicions. The late nights locked up in my room, the suspicious muffled sounds, the scrambling to conceal whatever it was that I was doing moments before they walked in the door. The truth is, my home is my favorite place to be a gamer. Why go to all the trouble of going out when I can just bring that world into my bedroom? This leads to some awkward confrontations with my parents, unfortunately. A disappointed, all-too-knowing look, and he leaves me be. To be honest, I doubt they would care that much if I told them. They probably already know. They’re just from a different era. I do things outside the gamer world, I really do. In fact, none of my friends are a part of the game life style. But when I get some alone time, when the world slows down for an afternoon or so, there’s nowhere I’d rather be. I love my friends, and I love the life I have on the “outside.” There’s just something about the game community that draws me back time after time. To be around that many like-minded people is liberating, and I wouldn’t trade the time I’ve spent there for anything. So here goes. Mom, Dad: I game. I live it, breathe it, love it. I game, and I’m proud. So the next time you see me shutting the shades in the family room on a sunny Saturday midmorning, don’t sigh and walk away. Accept the fact that this is who I am. My parents got stuck with the most difficult of all children. Despite their mild mannered respectful personalities, my were those parents who were always being called by the school for some reason or the next. While I am not sure what their guiding philosophy for me would have been had my brothers been more docile, I was quickly marked as the “easy child” and my parents had a unique way of raising me. They never put any pressure on me to do my homework or to go to sleep early, as long as I did what I had to do I had my freedom. Except when it came to gaming. I started playing WOW when I was in 7th grade and it was probably the worst thing that ever happened to me. I would play and play for hours on end. Socially I still never missed a beat, and I always did enough work to get a B+/A- but never pushed my self. Homework was done as fast as possible so I could get to the computer. When my parents tried to get me to stop I would argue with them time and again “I am doing fine, I have friends and good grades, nothing is out of control” but it was. I was just absorbed and making excuses for myself. My parents tried making me quit, but I would get so angry and upset, and I never got like that, that that they would be weak and I would soon get it back. I finally quit in 11th grade when I woke up and realized that I wanted to get into a good college. I played other games but nothing saps away all of your time like WOW does. I went back and dabbled in it for a few months after I got into college but quickly felt badly about it and dumped it for good. I am happy to not be addicted going into college. The problem with the previous paragraph is that it makes it seem as if WOW was all bad, believe me it wasn’t. I had a million good moments and nights I spent smiling behind my keyboard. They are regrettable now, but in the time it was all great fun. One of the funniest bonding experiences I have or maybe ever will have is that one time I went over to a friends house and saw WOW on his computer and asked him whether or not he plays. He told me he used to and quit and I lied and said the same thing. A few months later, after a party I had a bunch of buddies over, and because I had known them for almost a year (this was the end of freshmen year) I decided to let them in on the fact that I had been playing WOW all along. After showing off my character, my gear etc… My friend said “move over”. I gave him the chair and he logged onto a character, also of top level but with all of the gear that takes WEEEEEKS to get. The highest level everything. He started playing PVP and he was the rogue I always wanted to be. My other friend there also logged onto his lesser account. We had all been playing wow secretly for over a year. We then made a guild, arena teams the works and played multiple games together for the rest of high school including League of Legends, Halo and Heroes of Newerth. We no longer hid our gaming and everyone in the school knew about it. It was much better like that. A sadder ending story is that of my cousin. My cousin was a gamer, and I introduced him to WOW because I thought it would be good for both us if we played together. It destroyed him. He got better than me in under 5 months and his grades slipped drastically. He was lying to his parents that he was working when he actually playing wow almost every day and into the wee hours of the night. When he got to college and raw brain power could not make him pass, he failed out and then went on a study abroad program and failed that to. He worked in McDonalds for 5 months and is trying to study abroad again. We will see how that works out. I watch his account to make sure he doesn’t play now, because he lies even to me, but it seems he has replaced it with other games. I am not sure if he will ever break his addictive habit and it is hard having to be the one to watch out for him rather than watch him play. All in all, my parents were right in trying to stop me, my friends awesome for being like me in such a strange way, and my cousin… ruined. It has been a part of my social life with my friends, and part of my alone time at home. It has stressed the relationship between me and my parents, and made a different one of me and my cousin. It has definitely impacted my life.